Over the last two years, the polymer 3D printing industry has been in a state of tumultuousness marked by dozens of new competitors entering the market, partnerships for development of materials, and development of new print technologies. All of these and more have combined to create a whirlwind market that, in spite of so much activity and investment, has struggled to maintain its growth pace from 2012 through 2014 as customers have backed off purchasing in the traditional segments while adopting a 'wait and see' strategy. The demand for additive manufacturing in general has perhaps never been higher, but challenges associated with such rapid evolution in polymer and plastic 3D printing have suppressed growth in the face of historic interest in 3D printing at a professional level. As the global chemical and polymer suppliers of the manufacturing world move into position to exert more influence over the increasingly integrated 3D printing industry, market change appears imminent. Meanwhile, the commercialization of disruptive new print technologies such as those from Carbon, HP, Rize, and more all ensure 2017 will be a pivotal year. Opportunities in Polymer and Plastic 3D Printing - 2017 is the third generation of the world’s most comprehensive analysis of polymer 3D printing technology. In this new edition, market analysis is segmented by print technology market -as each major polymer print process settles into its own roles and established applications, our analysis has deepened to the specifics of each driving print technology and associated materials. Utilizing purpose-built proprietary 3D printing market models, the report is able to present detailed market forecast data on thermoplastic filaments, powders, photopolymers, composites, and more utilized in popular print technologies of material extrusion (FDM, FFF), polymer powder bed fusion (SLS, Multi Jet Fusion), photopolymerization (SLA, DLP, CLIP), binder jetting, and more. All available materials for primary polymer print technologies are analyzed and forecasted, including market revenues as well as material shipments, by industry and geography, over the next decade. 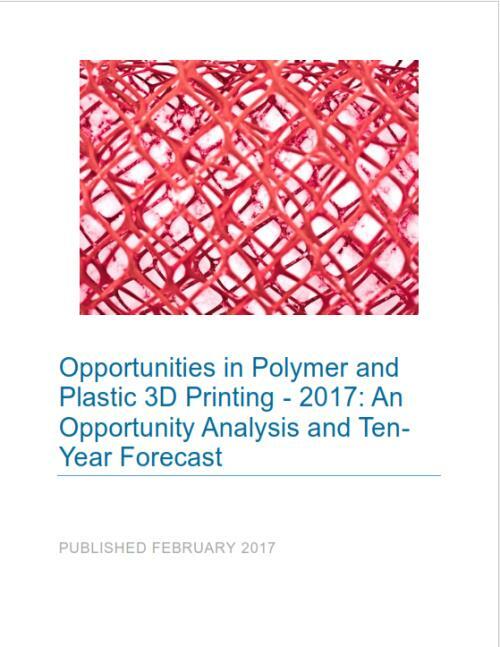 Therefore, the report believes that Opportunities in Polymer and Plastic 3D Printing - 2017 will provide exceptional value to business development professionals and internal market strategy teams for the global chemical and polymer industries, as well as polymer 3D printer manufacturers, print service providers, and developers of polymer 3D printing manufacturing solutions. 1.5 2016 Market in Review – Setting the Stage for a Global Manufacturing Revolution? 5.1 Binder Jetting with Polymers – Is Polymer Binder Jetting Viable for the Future?